Yamaha guitars have announced that Multi-Grammy winner, iconic guitarist and acclaimed producer Steve Lukather has embraced Yamaha's recently launched S.R.T ( Studio Response Technology) and is now using a number of LJX 26CPT and NX electro-acoustic guitars for recording and touring duties. The announcement precedes the release in October of Steve's eagerly awaited new solo album ' All's Well That Ends Well' and boosts the growing number ofcriticallyacclaimed artists selecting Yamaha Electro Acoustic models. A founder member of Toto Steve Lukather is one of the world's most respected producers as well as being a phenomenal guitarist. His extraordinary guitar playing can be heard on hundreds of records with the world's biggest artists from Michael Jackson, Paul McCartney and Eric Clapton to The Tubes and Van Halen.He is an 11 times Grammy nominee and 5 times winner. Lukather is world renowned for his music production acumen, often recording tracks in one take with minimum sound processing which makes the S.R.T endorsement all the more significant for Yamaha. Yamaha's proprietary S.R.T technology delivers exceptionally natural ambient acoustic guitar sound by applying highly sophisticatedsoundmodelingtechniques and data analysis to the output signal. This process is applied to four keyacousticelements that are omittedfrom conventionalpickup systems, these are String andbodyresonance, ambience, vintage microphone characteristics and professional mic techniques. This all combines to create a natural, studio quality acoustic guitar tone that was previously only attainable by professional studio recording engineers under studio conditions. 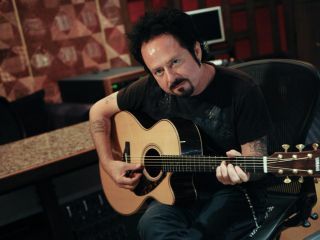 Steve Lukather comments "I am so blown away at the sound of these new acoustic guitars. Mind blowing. I tried them against all the others and there was NO comparison. Yamaha really brought the best to the design and sound and look! I am honored to be a part of the family."